Lightweight - Folds Small -- Rides BIG! Fun -- Fun -- Fun !!! Here's why I love this bike: First, it’s pure FUN!!! 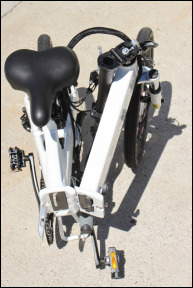 Light and nimble at just 45 pounds, it weighs 15 pounds less than most standard electric bikes! I can easily lift it on to my bike rack or take it upstairs without getting a hernia. I can fold it and easily stash it in the back of of my beloved Mini Cooper S. I can take it on a plane, train, bus, RV, or boat, or store it in my closet. And even with all the versatility of this portability -- I don’t sacrifice anything. I can ride it up to 45 miles on a single charge with its large 48 Volt 10+ amp (500 Watt/hour) Samsung (LiNCM) battery hidden and balanced in it’s beautiful frame. And it’s an absolute blast to ride with strong acceleration from its spunky 500 watt (750 watt peak) geared motor pushing those smaller 20-inch wheels up to 23 mph. 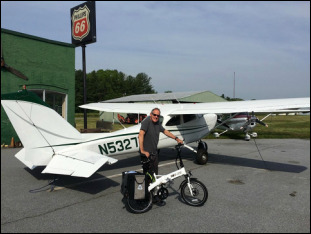 With an independent throttle and 5 levels of pedal assist, I can pedal it like a regular bike, power it like a motorcycle, do any combination of both -- or just let it add assistance to my pedaling. FOR 2019: an LCD display, bigger 180 mm Tektro disc brakes, a rapid-fire Shimano 7-speed drive-train, Kenda thorn-proof tires, a comfy Selle Royale gel saddle, and a suspension fork. And, built to last, and can be ridden almost anywhere. Plus, you’ll save BIG as it comes dripping with accessories: front and rear lights, chain-guard, fenders, mudguards, kickstand, luggage rack, ergo grips, and even a bell. And what a deal! This is the 9th year of the e-JOE Epik SE with hundreds of satisfied customers -- so it is a fully refined product. And especially with all the new 2019 upgrades, You will LOVE it! *Unlike many pure 'online' dealers, Your new bike will be professionally assembled, adjusted and shipped to your doorstep requiring minimum preparation prior to riding. Simply remove the bike and packing materials, fold it and lock the frame, pedals, and handlebar safety into place. Set the seat and handlebar height to fit. Your battery will be charged and tires inflated, though you may wish to top them off (tires to 50-60 lbs.). Check over to ensure everything is in good order. Then ........... Enjoy! The eJOE Warranty is available at the 'Vital Information' link.